PT Taifu Development located in Palazo garden complex, Kampung Belian Hoedspruit give special promotion this month, the buyer housing Palazzo Garden in Batam Center. Purchasers get a voucher, which can be used to purchase various kinds of furniture to complete all their household needs. "Vouchers are available worth Rp 3 million to Rp 6 million," said Heriyanti, Marketing Palazzo Garden. Knowing how much nominal vouchers that will be obtained, depending on how the payment from the buyer. Hard cash, direct voucher worth Rp 6 million. While for installment payments gradually 2 years and 3 years to get a voucher worth Rp 3 million. "Gift vouchers are very limited, could only find buyers at this January alone," explained Heriyanti. Not only that, PT Taifu Development as the developer Palzzo Garden also offer other attractive. buyers can customize the layout of rooms within the house according to the wishes of buyers, for homes that are still under construction. 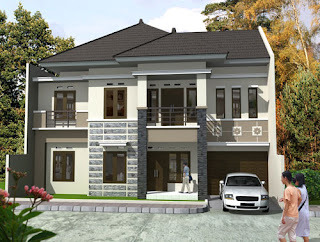 For example, a house that has 3 rooms, buyers can order the developer to make a 4 bedroom. For the location of the kitchen, bathroom, living room, bedroom, color tiles, it can be made according to buyers wishes. Thus, at the time the buyer to inhabit the house, do not need to pay that much to renovate the house again. PT Taifu Development seems talkative do not want to follow a minimalist design that is now being offered by other developers in Batam. Through their projects the housing Palazzo Garden, they show the style of Italy to house a large type which is currently entering the development stage. Heriyanti add all types are offered a two smallest types ranging from 91 to 220 types. Handover plan was conducted in July 2010. "The development we have carried out, especially for type 117 and 113 and some even have reached 40 percent," said Heriyanti, Friday (15/01). Price starting from Rp 388 million for the purchase of 113 types of cash. Prices are already discounted by 20 percent of the price. As for the purchase with cash gradually by 15 per cent discount. "If the purchase by way of mortgages will be given a discount of 10 percent, while the down payment or a down payment (DP) is charged by 30 percent. Booking fee is only Rp 5 million alone, "he added. With these prices, PT Taifu Development as the developer and eliminate the cost SHGB AJB. The appeal of housing in the area not far from Belian village is located in a very strategic location. Exclusive occupancy is only about 500 yards away from the Mega Mall shopping center, government center, police station, Masjid Raya Batam Center, and others.